If a mysterious trill catches your attention in the night, bear in mind the spooky sound may come from an owl no bigger than a pint glass. 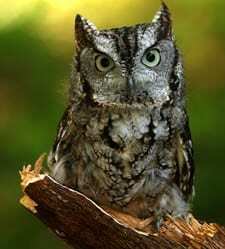 Common east of the Rockies in woods, suburbs, and parks, the Eastern Screech-Owl is found wherever trees are, and they’re even willing to nest in backyard nest boxes. These supremely camouflaged birds hide out in nooks and tree crannies through the day, so train your ears and listen for them at night.